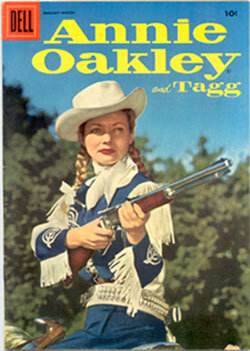 Do You Remember... "Annie Oakley"
TV’s first female heroine was Gail Davis. 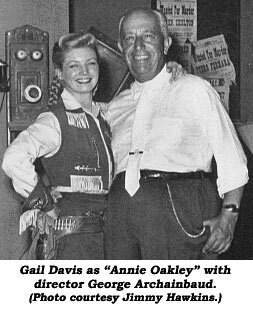 From 12/11/53 through 3/1/57, Gene Autry’s Flying-A Productions produced 81 b/w half hour episodes of “Annie Oakley”, with reruns to 1960. Set in the mythical town of Diablo, AZ, Annie kept law and order with the aid of deputy sheriff Lofty Craig (Brad Johnson), who handled all the fisticuffs, and Annie’s kid brother Tagg (Jimmy Hawkins). Tagg was played in the original pilot by Billy Gray. 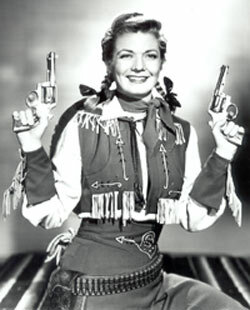 In the pilot, Annie’s uncle was Sheriff Luke McTavish (Kenneth MacDonald), thereafter seldom referred to. Annie, in a conversation with Tagg, refers to their mother’s death. Annie’s horse, Target, was played by at least three similarly colored Palominos. Tagg’s horse was Pixie. Gail was usually doubled by Donna Hall but sometimes by Alice Van (who later married director R. G. “Buddy” Springsteen). In 1955 AO licensed merchandise topped $10,000,000 in sales. 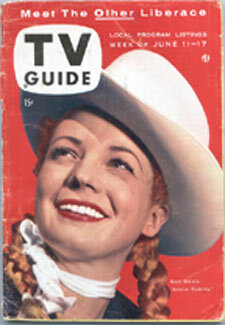 The series was guided by veteran western directors such as George Archainbaud, Frank McDonald, Earl Bellamy, the disliked Ray Nazarro and D. Ross Lederman. Many of the scripts came from the prolific western pens of Norman S. Hall, Robert Schaefer (Mandy Schaefer’s nephew) and Eric Freiwald, Maurice Tombragel and Paul Gangelin. Brad Johnson was only 56 when he died in 1981. Hawkins, 55, went on to produce TV movies and has sat on the board of the Donna Reed Foundation which awards scholarships in performing arts. Gail Davis died of brain cancer at a Burbank, CA, hospital March 15, 1997.